"I like experiencing things with other people." And the people of OLLI, she says, have become "a circle of friends with whom I spend most of my time. We all joined as newcomers and were able to make friends so easily, with the joy of living and learning." Jan Tuchinsky has been a distinguished volunteer for OLLI in many capacities, culminating in her recognition as the 2013 Bill Wright Award winner as Volunteer of the Year - and it all began because she couldn't drive and read at the same time. Jan moved to Durham from Binghamton, NY in 2003, choosing Durham because of its diverse cultural offerings, Duke University, and her daughter, who works for Duke Corporate Education. A friend suggested she join OLLI (DILR at the time), and she signed up for the 2003 Fall Retreat at Wild Acres in the North Carolina mountains. But in those days before GPS was pervasive, she needed someone to ride with her to read the map and navigate. And when she saw that OLLI was asking for volunteers to drive to the retreat, she saw the answer to both needs - thus began a long and rich OLLI volunteer career. Actually, Jan's OLLI service was the latest in a tradition of volunteerism dating back to 1997, when she began to wind down a successful executive career in the electronics and light manufacturing industries. 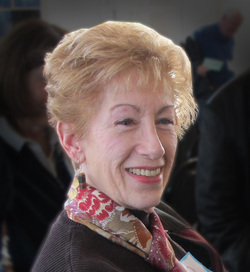 Living in Bloomington, Indiana at the time, Jan put her considerable financial expertise (she had been CFO and VP of Finance for several companies) to work for the Bloomington Pops Orchestra, the League of Women Voters and the Service Corps of Retired Executives (SCORE). From her first OLLI class (on the Trumans, taught by UNC Professor Robert Porter), Jan found the program to be a perfect outlet for her intellectual curiosity and social nature. Her most memorable class was titled “The World According to Eve”, taught by Mary Ann Gross and Peggy Quinn. It explored the female perspective on a variety of topical subjects, and the class became an exploration of personal experiences, insights and sharing for its all-female members. "We were thinking in depth and expressing ourselves in a safe and nurturing environment", Jan says. "I made several lasting friendships from that class." As she took more classes, attended more events and made more friends through OLLI, Jan wanted to expand her volunteer contribution: "I didn't want to just keep taking - I wanted to give too." Jan joined the Board of Advisors, and has been active on several committees, including the Bylaws Committee, the Strategic Planning Committee, and the Finance Committee, which she chaired. But she hasn't limited her contribution to administrative or strategic roles - Jan has volunteered as a class assistant many times, and has regularly worked on the planning and execution of the Spring and Fall Retreats. Jan’s greatest wish for OLLI is a dedicated facility – a versatile, well-equipped “home” that would benefit members, Duke University, and the community at large. As a member of the OLLI Strategic Planning Committee, Jan is working on this goal, and reports that the Committee is beginning to make some inroads. In addition to her OLLI activities, Jan is a longtime volunteer for the Jewish Federation. She is active in several reading/ discussion groups, and enjoys the Symphony, the Ballet, and HD Opera outings with friends. Smiling, she says, "I like experiencing things with other people." And the people of OLLI, she says, have become "a circle of friends with whom I spend most of my time. We all joined as newcomers and were able to make friends so easily, with the joy of living and learning."